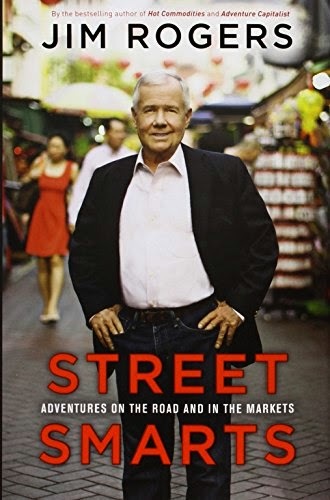 This is actually part 2 of of Jim Rogers' Street Smarts' book review in my blog. In my previous post, I focused on his advice on personal developments. 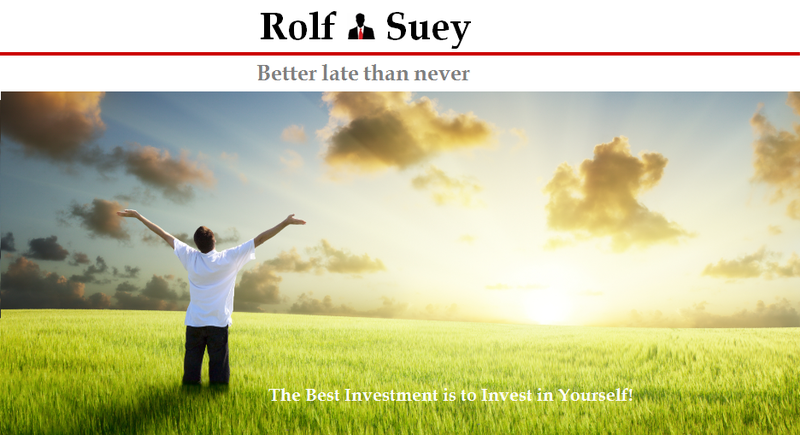 In this article, I will focused on Rogers advice on investments. I will conclude with a final post later detailing Rogers' views on where/which is the best countries/areas to put your money in. The sequence of the 3 posts are in fact relevant to a person's life developments in general. No matter how you wanted to excel in your education, career or relationship etc, first you must always developed and improved yourself. To be able to think properly and be a good person. Then you acquired the skills in a particular field. Finally you apply what you have learnt and excel in the particular field. Anyway enough of my philosophy, below is the summary with excepts from the book. In 1970 Jim Rogers bought puts. Market collapse and his money tripled. After that he sold short, but market never collapses and he lost all money. “Losing everything can be beneficial because it teaches you how much you do not know. And if you can come back from a failure or two, chances are you are going to be more successful in the long run. E.g. Mike Bloomberg is sacked from Salomon Brothers before he founded Bloomberg. Invest in What You know Best - Do Not Listen to Me - Do Not Listen to Anybody. “Mother call saying she wanted to buy the stock. I asked why? She says well it tripled over the last year" I say "no mother, you don't buy it because it has tripled, you buy it before it triples!" “In a bull market what you want is a kid who is too young to know that what he is doing is foolish. You want a kid who will race into the bubble and leverage it higher and higher. When things go bad, you certainly do not want that kid around. The kid is probably not going to be around by then anyway! I am agreeing to all the above points from the book. Specifically, I wanted to highlight on the point of making mistakes. There is a Chinese saying 失败是成功之母 which literally means failure is the mother of success. But failure can only be considered the stepping stone to success, only if you still can make a comeback. It is also important to experience it early. I will like to share a personal experience. While I was in my last year of National Service in the late 90s, Singapore Pools had just legalized the betting of S-League football matches. With my income earned from part-time tuition and salary from army, I managed to accumulate savings of close to three thousands in more than two years. Unfortunately, I started to indulge myself into Sg Pools football matches betting. Me and two of my camp mates were so engrossed that we will discussed about bets all day, read "football betting manuals", queue up at 7-Eleven to place our "winning bets". After awhile, we started to devise some "smart (really stupid)" betting methods ourselves. It goes like this, choose the most common score in a football match. We think it is 2-1 score. Then bet $10, if lose, bet 20$ next time, if lose again, bet $40 next time, so on and so forth. It was really effective at first, and I remembered there was once, I am collecting more than $800 of winnings from the Sg pools counter. The auntie said to me "boy, not bad huh....better than winning 4D!" I was so proud of myself then. Two of my camp mates coming from rich family were having even bigger bettings wining initially in terms of thousands. We thought we were the cleverest people around. Now that I think of it, I realize we were the biggest fools then! We thought our method were fool-proof until our appetite got bigger and bigger. "Not everyday Sunday!" Eventually the more I lost, the more I bet the next times and the more I lost. My last bet was >$2,000 on a single ticket. And Yes.... I blew it. All my savings throughout the entire National Service was wiped out! My two other friends lost each more than $5,000. I was 20 then, preparing to go to University after ORD. Suppose to have thousands of my hard-earned money to spend. Yet, it was all gone in a few months time. I was devastated and vowed never to gamble again. Except for some small gamble in tens of dollars during Chinese New Year. And yes I still honour that vow today. I am happy that my foolishness happened early and the amount lost was not that significant. More importantly I learnt from my foolishness. Or have I, I still dabble in stocks? I can totally relate to your experience as I was also high on the list for Spools until online betting take over. Must say that I was lucky to be able to break away from that jinx as those can be really addictive and damaging. At least for stock investment, we do justify the reason for buying it than buying blindly. But glad that you managed to break away from it. Yeah, invest in stocks is different. More to it than just hitting buy or sell. I remembered few years ago I was introduced to online betting, I bet on soccer games and won some cash with some formulas.. e.g if the match is 0 - 0 on first half, buy Total goal more than 0.75. usually win, it's quite hard to see matches go total goal 0 according to the statistics. But GREED took over, i placed more and more money into every single bet. in the beginning putting the minimum bet of $40 dollars is already heart pumping for me but as time goes putting $200 or $400 became very fluent and natural for my finger to key in. Theres always a winning formula with calculated risk in gambling but the point is we always lose the devil inside us. not to mention the loss sleeping time when i set alarm clock to check live score to see whether i win or not. Seems like we were all once gamblers. For football bets it's luck eventually. People say "the ball is round!" Unless "kelong". Have to agree that it's better not to bet. The style of betting you adopted is what they call a Martingale strategy. It has intrigued me over the years since I first read about it and I've always fantasized about testing it out in a casino. But it requires you to have exceptionally deep pockets in order for it to work (the more money one has, the more consecutive losses one will be able to stomach). But once one runs out of money, it's goodbye.. Thanks for informing about the Martingale. I learn something new again via blogging. So did you try it over at Casino??? I googled it.... and yes... I was bankrupt then! "The gambler usually wins a small net reward, thus appearing to have a sound strategy. However, the gambler's expected value does indeed remain zero (or less than zero) because the small probability that he will suffer a catastrophic loss exactly balances with his expected gain. (In a casino, the expected value is negative, due to the house's edge. )The likelihood of catastrophic loss may not even be very small. The bet size rises exponentially. This, combined with the fact that strings of consecutive losses actually occur more often than common intuition suggests, can bankrupt a gambler quickly." Haha I never tried at casino but I heard some casinos impose minimum and maximum bet. So let's say the minimum bet is $50 and maximum is $10k. That would mean you can only bet like 50, 100, 200, 400, 800, 1600, 3200, 6400 before you are forced to stop. That would mean if you play a game that gives you 50% odds to win (e.g. guess big or small number) and you lose 8 times in a row, you are out with a $6.4k loss. And the odds of that happening are not that low, i.e. 0.5 to the power of 8 = 0.390625%. You may win money on most days but one day that 0.390625% is going to hit you and can potentially wipe out all the winnings you had made before that. Haha... the casino is always the overall winner. For gamblers, you just need one bullet on the head to kill you. I have also been interested in the Martingale strategy for a long time. The first time I read it in the article about different roulette strategies https://casinority.com/15-winning-roulette-strategies/ and it was a discovery for me. I haven't tried to use it yet, and I'm not sure I will do it in future, but it was quite interesting for me to read different opinions about this stratagy. Jim Rogers has an interesting life! It shows that coming from humble backwater background is not a handicap. Having a liberal arts education is a plus! Quitting at late 30s does not mean there's nothing to do next! And it perfectly OK to change your mind and start having kids in our 60s!!! Haha actually I agree with the resistance to diversification, but that is only for people of those calibre. For normal investor like me, who are equipped with mediocre skills, and neither have the balls nor time, I still choose to diversify! We were once kids! Humble background can sometimes be a stimulus of being street smarts. I have a client who is in his 60s and he married a 30 year old air stewardess wife he knew while on the plane. They have a toddler too. Every inspiring quotes and post there you have. Helps reinforce my thoughts about life and investing. Thanks for the compliments. I somehow felt "NATO" (learnt from Ah Boys to Men) lately - No Action Talk Only. SMOL still waiting for boat to arrive? When it arrives, it can be a cruise ship with splendid entertainment! Previous time I also contributed to the SG pools towards S League grass planting. May write a post about my folly. Haha. Haha. Our contribution is both good for SG Pools and S-League. Without the betting, maybe S-League's audience will drop greatly. The temporary folly in the past is the backbone of the formidable now. Thought you might be interested. let me know thanks! It’s a good thing that students compare themselves with the others in essay on line. One should compare his positive points with the positive of others not with the negative of others. Comparison should be positive and neutral to move forward. This post give me good advice how to invest your money in business and how to plan your future thanks for share it effective paraphrasing .